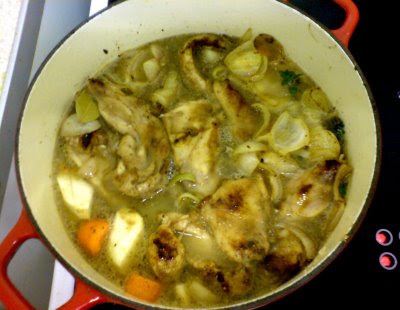 Rabbit Stew: Rabbit in Cider - the first one in the pot! The first time I cooked a rabbit that I'd shot I adapted a recipe I found on the Channel 4 recipe page. First, I fried a bit of bacon then, after putting the fried bacon in a casserole dish, I put the jointed rabbit into the pan - a couple of pieces at a time - to sear and seal the meat and then I fried some shallots as well. Then I put everything into the casserole dish together with carrots, a bit of celeriac that was knocking about in the fridge, some sprigs of thyme from the window box, a blob of honey and about 500mls of good, dry cider. I seasoned with salt & pepper and then I brought the heat up so that all was at a very low, gentle simmer, and then I left it for a couple of hours. For the last thirty minutes I threw in a couple of handfuls of brown rice and this soaked up the excess liquid a treat. How was it? Well, the months of preparation I'd put in - learning to shoot, getting permission, getting a gun, finding the rabbits - had certainly sharpened my anticipation of the dish, but anticipation aside, I honestly did still think that it was the best thing that I'd ever eaten.